Football* is art. Football is an exact science. Football is a real time strategy game where two competing armies strive to make the most of the resources they have available to them through the positioning of the right player at the right time. Julius Caesar might have good options on the right flank, to which Napoleon might retaliate through a tight defensive formation covering the area. There is a reason why football is called The Beautiful Game. 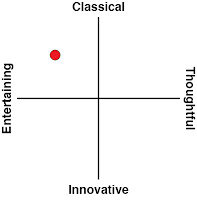 It is a mix of the deterministic with the stochastic, made possible through various game mechanics honed over decades and centuries. Centralised control is given up at the start of the match, when (with the notable exception of substitutions) the hive mind of the combined players takes over. Mechanics such as the offside rule slow the game down; the generally low score affair keeps tensions up by enabling the frequent upset where the David can beat the Goliath for real. 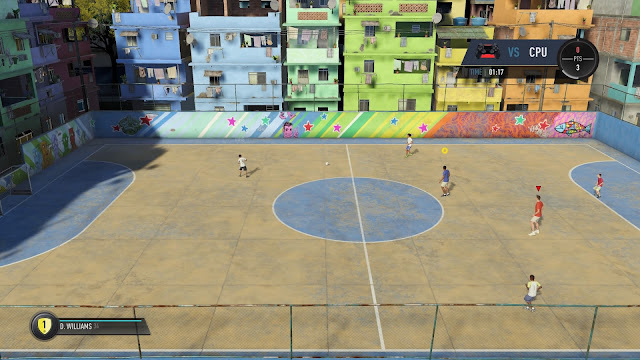 Electronic Arts’ FIFA series was not the first incarnation of a football video game I ever tried my hands on (that honour was bestowed upon Pele for that Atari 2600), but it is certainly the most famous and probably the longest running. I was first acquainted with it during the early to mid nineties, when a friend sat me down and ordered me to watch and listen to this new game he got. Listen, because then’s FIFA was the first game to offer - as far as I could tell - live voice commentary that related to the action actually taking place. It was certainly more sophisticated than hearing the same sentence repeat itself again and again. FIFA has played the "authenticity mixed with technologically advanced" card ever since, but the series is not without fault. While it was in the nineties that the series had won me over to the level of utter addiction, it was during the previous console generation that FIFA and I parted ways over ideological disagreements. You see, I was from Mars, the strategy oriented person that I am, while FIFA chose to be from Venus, focusing on the spectacular trick action that is very rare in real football and even more rarely wins matches. We can argue what the cause of this behavioural change was: I would argue that the same TV rights that brought football the huge amounts of money it is still swimming in is at fault. FIFA, the video game, tried to appeal to the vast quantities of fans that found themselves hooked on football as TV spectators rather than stadium attendees or kids growing up playing football on the streets. Australia, the place I now call home, represents such a case: most Aussies are not used to watching whole football games, but rather the instant replays of Messi’s latest juggling act. The focus had turned from the game itself into its celebrities. In turn, the FIFA franchise followed suit, aided by technological progress that made yesteryear’s stick figures into identifiable humanoids. I therefore decided divorce would be the best option for the two of us. But throughout the years, FIFA kept to its “mythical girlfriend” status. I made sure I’m familiar with what it was up to, but at the same time I took care not to stalk or interfere where a person of my football inclinations was unwanted. But now, the time has come to say fair fair; when the editor asked for a FIFA review I assumed my best nonchalant face, and dove straight in to a blind date with this old, dearest, of friends. Anyway, while the editor is bound to go for my neck after an exposition this long, I am of the opinion historical perspective goes a long way towards informing us how we got to FIFA 18 and where it stands even before one starts downloading it. FIFA 18 is a product of the history that had shaped it into what it is. History aside, no less important is my need to explain why this is not going to be one of those “so what has changed since the previous year’s FIFA” type of reviews; having not played the current console gen’s FIFA incarnations in depth, I am unable to provide such a perspective. Feel free to point a blaming finger at me if you wish, but I will point out that perhaps what the FIFA series needs the most is the perspective of a loving, caring, outsider. The very first thing I can report about FIFA 18 is that it is a huge game, size was. At around 45GB, it literally took an entire day for me to download at Great Australian Internet speeds. No worries, says Electronic Arts, letting downloaders start playing after a mere 8GB download; you will be limited to friendly (albeit Champions League grade) matches, though. Traditionally, for me, starting a new game of FIFA meant picking my favourite team (whose name I will not disclose due to a long spate of pathetic performances; books have been written about this subject matter) and checking it out. 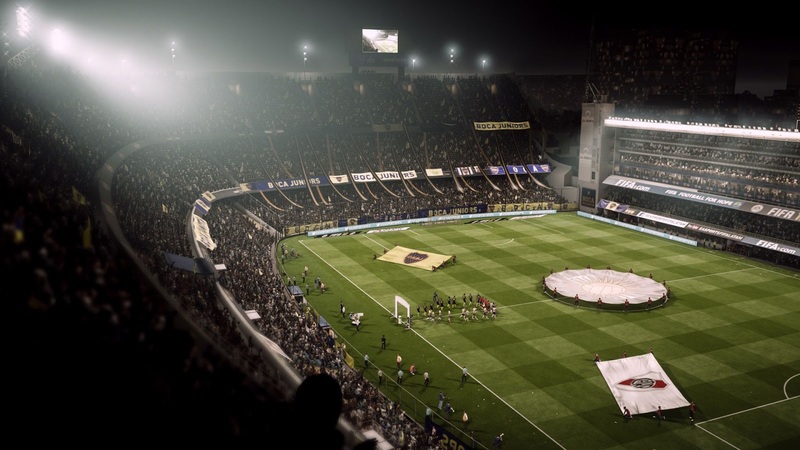 FIFA 18 had other ideas, though, opening with an exposé featuring a La Liga match between Real Madrid and Atlético Madrid. The cut scene concludes in the 70th minute, with the score being 1:1, and me assuming the role of FIFA 18’s cover boy Cristiano Ronaldo as he is about to make a penalty kick towards goal. Naturally, being the loyal fan that I am, I choked. 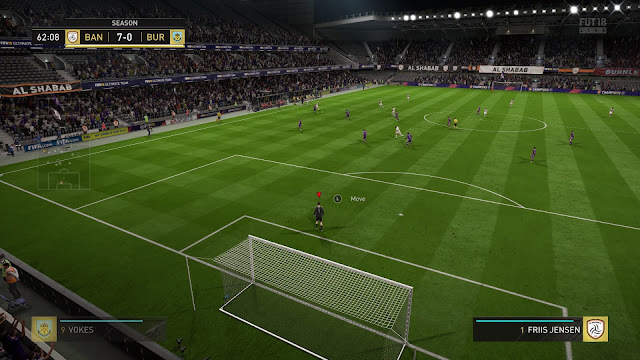 Seriously, though, FIFA didn’t even bother letting me know what button I need to use in order for Ronaldo to kick, let alone aim. Point being, even at this early stage, FIFA 18 seemed to be trying hard to tell me that this game has been designed for the series’ frequent flyers (others need not apply). That said, through that first last third of a match I already noticed some very positive signs. I really appreciated how the camera takes a step back from what we grew used to through TV coverage, thus offering a bit more of a tactical perspective. Also notable was the realism of the presentation, marred only - but generally not too much - by the still somewhat ghostly presentation of familiar players. I point my finger at characters' fixed facial expressions (limited to extensive blinking), blank looks and and unusually bendy backs. Which is to say that Electronic Arts may have significantly improved what it can milk its Frostbite engine for over FIFA 17 and Mass Effect: Andromeda, but affairs are still quite frosty and the uncanny valley is still very much there. Ghosts aside, the presentation looks and feels like a top notch TV football broadcast. Martin Tyler and Alan Smith are at the microphone yet again, while the sounds and various captions mimicked the exact gestures a real life La Liga TV broadcast would use. Between player hand gestures, with or without the ball, the cameramen on the sidelines and the stadium’s PA announcements, FIFA 18 was as close as I ever been to a real life TV broadcast as any video game I had ever seen. 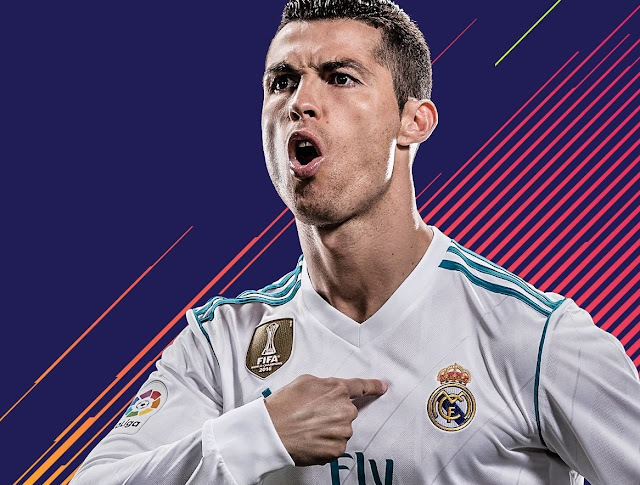 Which, I will note, ties back to my previous argument on the effect TV dollars have had on the sport of football; to all intents and purposes, it feels as if FIFA 18 aims to provide the “authentic” TV experience to its players. 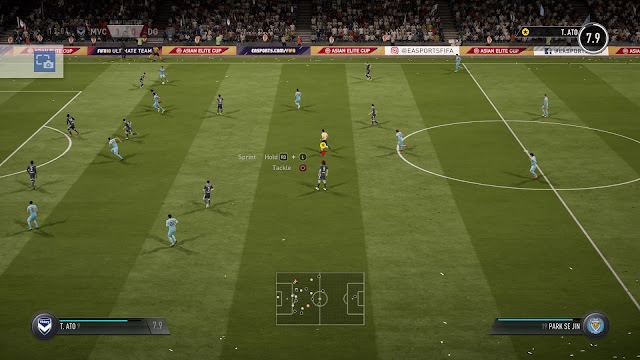 I can only assume Electronic Arts has consciously made the decision that it is the TV experience that is the best representation of what a live football experience can be when playing a video game. I will not argue the point yet, but I do consider it critical when evaluating the FIFA 18 experience. With the Madrid derby proceedings over, I was handed over to the business as usual face of FIFA 18. If the stadium’s immersive sound design offered impressive authenticity, the menu system offers the usual FIFA impressive soundtrack of contemporary music. War on Drugs FTW! The same cannot be said on the menus themselves. These are clattered with multiple tabs, each filled with tiles, with some tiles also featuring their own set of internal tabs. Obviously, the tabs and the tiles change into brand new sets of tabs and tiles when a certain tab inside a certain tile is selected. I also found it hard to tell exactly what option it was that I was selecting, because the user interface informs the player of the currently selected option by painting it blue rather than white; not the most obvious way of selecting from two options. 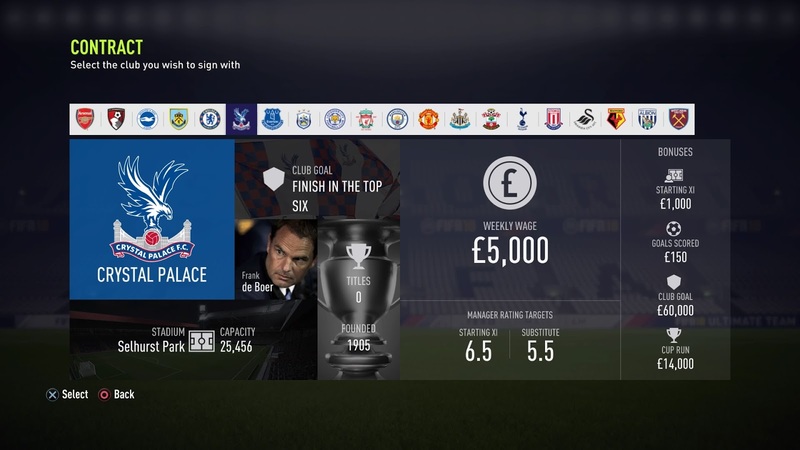 Perhaps I am too much of an old timer; it would not surprise me at all if I was to learn there were game options I totally missed out on due to the mess that is the FIFA 18 menu system. What is definitely more likely is that I missed out on some tweaking features that would have done something to improve my performance at a certain game mode. 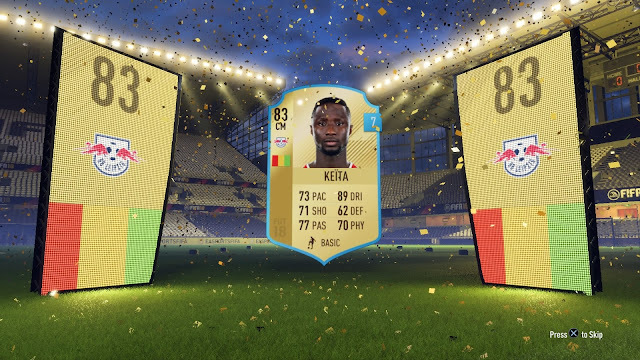 Did I mention FIFA 18 feels like it was mostly cooked for FIFA frequent flyers? That cacophony of menu options is there to serve FIFA 18’s numerous game modes. There is plenty to choose from: friendly matches mode, Hunter Returns, cup mode, manager career mode, player career mode, online mode, Ultimate Team mode. 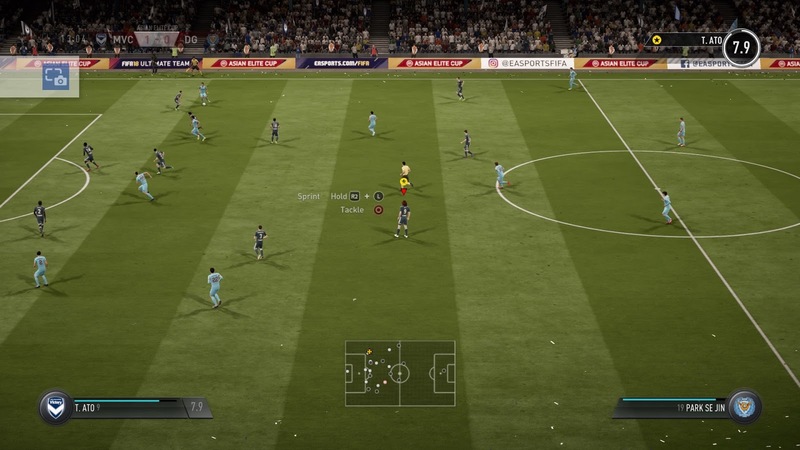 Not to mention a customisation mode that lets the avid player tinker to their heart’s content with team lineups, tactics and goal celebrations. 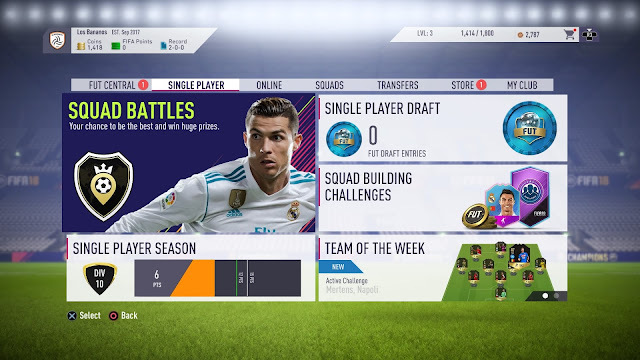 Each game mode packs its own heat but, at the end of all the messing about with the menus, lies the same FIFA 18 pitch experience. Let us go over some of the modes to highlight what they stand for. To start with the obvious, friendly matches allow any male team to play any male team in FIFA 18’s large roster of teams from all over the world, or - alternatively - play international female football team matches. Cup mode takes the next step, letting the player pick a team and run it through a certain competition (say, FA Cup or English Premier League). RPG like elements are offered when competitions are involved, letting the player hone the skills of specific members of their team while, at the same time, letting the player improve their acquaintance with FIFA 18 controls. It’s nice, but it is also a bit of a grind. Manager mode puts the focus on the personal career of the manager rather than the team, but it lets the player experience the full flavour of a team’s football year as opposed to a single competition. In contrast to my memories of old FIFAs, the manager is much more involved in the transfer market than he used to be. FIFA 18 will even take you, the manager, to personally meet thy fellow managers at an office and let you haggle for a transfer bargain. Affairs are portrayed through shaky reality TV style cameras. I will argue the voyeurism joy out of this staring into the dark chasms of the football world fades quickly as one gets the point; yet it is still fun to witness the visual expression of a renowned manager as I offered them $1000 for a world class player. Note my use of the word “he” to describe my FIFA 18 manager was not coincidental. In this year of our lord 2017, a year in which a female is very successfully refereeing Bundesliga matches, FIFA 18 still votes “No” on female managers. As a bonus “No", manager mode does not apply to the aforementioned international female football option. It was good to see FIFA start to include the women's game. It's not so good to see that this year it continues to be an afterthought, rather than a genuine effort to reflect diversity in the game. There's a lot more that could have been done to integrate women more deeply into the game here. 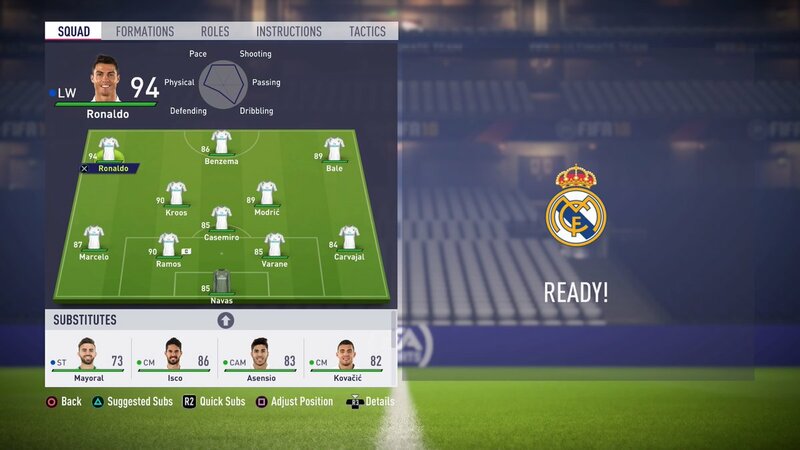 Ultimate Team mode reshuffles the cards, literally, by assembling a crew of generally mid tier players, most of whom originate from a country of your choosing, and then pitting this personal group of mercenaries against other (famous) clubs from the real world. Some famous world class players come to your aid from time to time, and your achievements on the playing field as well as standing up to daily targets will unlock points that you could then use to improve your deck. Yes, FIFA brings in the worst mechanics in the addiction arsenal; it is therefore only natural, in these days of the dreaded in-app purchase, for it to allow players to invest real life money in the acquisition of random boosts, too. One peculiar thing I had found with Ultimate Team was me not being able to change FIFA 18’s difficulty level once I had my Ultimate Team established. I seem to recall the game issuing me a warning on that through the voice of Martin Tyler, and it may well be that the option does exist somewhere in those elusive menus; but as it happened, my FIFA 18 skills improved through playtime yet my Ultimate Team was stuck on boring difficulty levels. Personally, I found FIFA 18’s player mode the most interesting option, as the game experience is vastly different when playing a sole player rather than the whole team. Instead of a game about moving the ball, playing as a single player is more about positioning that single player and being there at the right time in order to make a difference. For example, you can make a difference by distracting defenders (although FIFA 18 will not reward you for that). Unlike all the other modes, this one really does feel like a different game. One can go a long way with player mode, from rookie to manager. Obviously, the ultimate player mode incarnation on offer by FIFA 18 is the Hunter Returns mode. Here you will get the chance to take Alex Hunter through another year of his football career life. If, that is, you manage to survive the horrific flashback that’s there to bring us up to speed on Hunter’s previous episode: my wife was shocked by how awful its depiction of human faces was; I can only suspect the flashback was a FIFA 17 leftover that did not get this year’s graphics update. Hunter Returns’ contribution to FIFA 18 is by adding a narrative to the equation. Sure, I’ve enjoyed the mode, but it did make me wonder about the need for a narrative - or, by the same token, the need for all those modes I am describing here - in a game that is supposed to be a football simulation. Is the glut of modes the desperation of a developer trying to appeal to everyone with this game? Perhaps it was all down to the less than Nobel Prize in Literature grade of a plot that we have at hand. Or the routine of training, match, cut scene, famous cameo, rinse, repeat. In between rinse sessions you do get to make Mass Effect-like renegade/paragon like choices, but at stake is mostly the balance between Hunter’s Twitter followers and his manager’s tendency to feature him in the starting lineup. Last in the FIFA 18 game modes collection is the online option. Or rather, options; there are tons of them, carefully tailored for those of us whose life fails to supply them with enough humiliation. You can play online in friendlies or seasons, in co-op mode (which seems to still pit you and your co-op partner against other human opponents; I wasn’t able to verify that as I had no friends available), or as a single player in a game involving 21 other real human players. You can even use the online mode to watch live streams of FIFA 18 action from inside the game! Me, I would rather have another hole in my head, but I believe in choice. It is probably worth pointing out Ultimate Team mode has its own collection of online modes, just in case you were under the impression FIFA 18 fails to deliver enough gaming modes. Last, but not least, I will mention local multiplayer is still very much alive and kicking even if it does not receive its own menu tab or tile. Yours truly admits he almost failed to notice the option existed in the first place: I had to have a second controller switched on for the option to be pointed out. Further criticism at the FIFA 18 user interface aside, local multiplayer will let you either play against a local friend or co-op with a local friend (who will play as the one receiving the pass). Trying as hard as I could, the referee kept ignoring the aggressive tackles the player without the ball attempted upon him; in previous FIFA incarnations, my friends and I used to love competing on who gets disqualified through such red cards first. After the dust has settled, and assuming you’ve survived the menus to bravely choose the mode you want to experience FIFA 18 through (all the while wondering what it is that the game is trying to hide by offering so much choice), the real deal will begin: a football game, set - by default - to play over two six minute long halves. Question is, how good is this simulated football experience? Starting with raw mechanics, I can report my team players feeling rather slow. For example, rushing to the ball, even across a bare few centimetres of TV screen real estate, is usually a useless waste. On one hand this slowness feels a tad unrealistic, but on the other it creates the game this would be Pep Guardiola prefers: a game that lets the ball do the talking in a more tactical, rather than arcade like, game. Through this going getting tough, FIFA 18 becomes a game of making the most of open spaces, that art of positioning that right player to be there at the right time. I would say tiki-taka football lovers rejoice, but that is not entirely the case. For example, turning when receiving the ball with your back to goal feels slowish, too. More importantly, FIFA does not provide controls sophisticated enough to allow the tactician football manager in you to concentrate lots of players in a relatively small area and have those players move with the ball. Imperfect as it is, I much (much!) 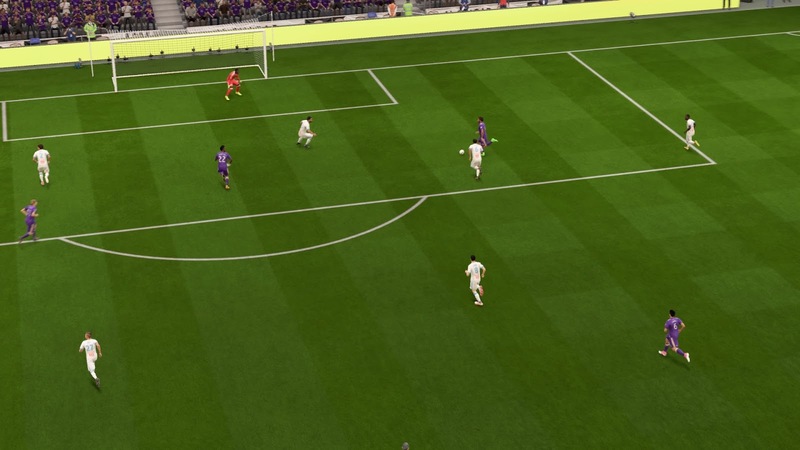 prefer this tactical state of affairs to former incarnations forcing players to become one with their controller’s buttons so as to allow the player with the ball to cut through a line of defenders. My brand of football is the thinker’s game. I did note I was scoring spectacular goals much more frequently than I can recall throughout my illustrious FIFA career. You know, those ICBMs that gravitate majestically to the top corners of the net, perhaps hitting the bar on their way in. They definitely occur much more often than they do in real life. It is nice and flattering when it happens, but given FIFA is one of those games that sees me clocking hundreds and hundreds of hours, and then a couple more hundreds of hours, I do wonder about the longer term effects of turning the spectacular into the mundane. When magic is everywhere, is it still magical? As I tried to pick my way around the gameplay, FIFA 18 offered a helping hand through what it refers to as a training mode. This displays a caption over the active player to let you know what button operations are available to your selected player at each moment, as well as provide directions indicators for actions. Similarly, in relevant modes FIFA 18 will also offer its recommended substitutions to you, which in general can improve game flow. You can set a lineup of quick substitutions in advance instead; actually, you probably should, because the AI behind the recommendations didn’t seem to catch on to my tactics. Talking about tactics, the various teams’ different tactics and formations do make a real difference. FIFA 18 does not feel like you are playing the same team again and again. Generally speaking, I found the teams I am more familiar with to play with their up to date real life formation, perhaps with some minor presentation related differences or lineups that differ from recent history. Women's international football is no longer new to FIFA. Frankly, other than the players’ looks, I had found it indistinguishable to male football; which is probably the way it should be. As far as I could tell, Women can only play against other women. I do wonder if this is to protect the world from the worst type of misogyny arising. I can continue to analyse the feeling of FIFA 18’s gameplay much longer, but at the core I still feel there is plenty amiss. I admit to judging FIFA 18 harshly in this department, but that is only because it is more than its own game; its aim is to simulate a real life game. It will thus always suffer penalties when straying from the authentic experience. And yes, there are plenty such deviations to report. 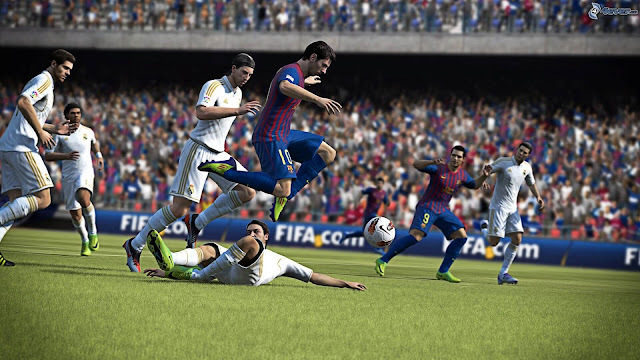 To cite a few examples, the FIFA frequency of high scoring matches is higher than real life. In contrast, nil all scores are quite common in real life football (despite the fact real life football is played over 90 minutes, not 12). Then there is the abundance of goals conceded at the near post, and not necessarily by players of Ryan Giggs’ calibre. The home vs. away match factor isn’t much of a factor, and the CPU won’t play to waste time when leading. There is actually much more to add regarding CPU controlled players’ actions. 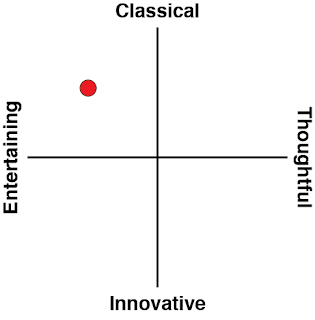 Generally speaking, they lack spontaneity in their actions. Whether the name on the back of their shirt is Ronaldo or Never Heard Of, the CPU players all tend to behave rather too predictably. That, more than anything, is the embodiment of my biggest complaint when it comes to FIFA 18 as an accurate simulation for what’s happening on a real pitch. I am well aware this criticism applies to previous episodes of FIFA just the same, but I feel the game’s focus on reducing real life football players down to a few vital statistics does much injustice to the game of football. Maradona wasn’t the player he was, the guy who seemingly won the Serie A for Napoli by himself, because of the stats that FIFA 18 models; his team won the title because of his leadership and spirit. It appears the technology to turn that, as well as much else that makes up what we often refer to as the human spirit, is still lacking. 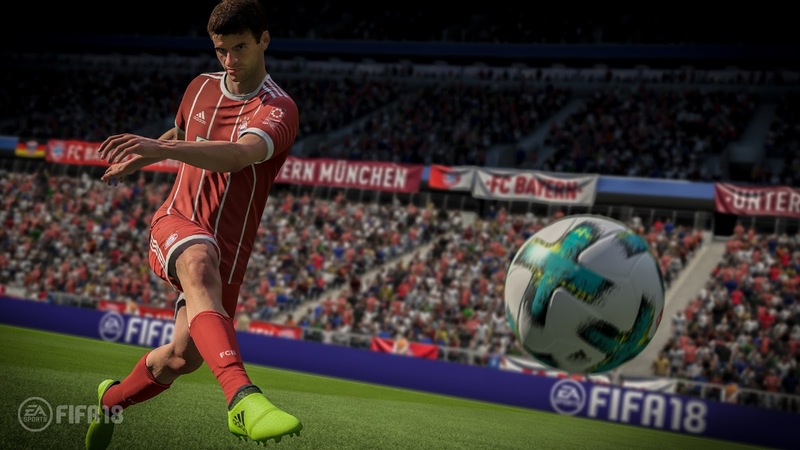 FIFA 18 chooses to compensate through all sorts of distracting means, such as an overload of games modes or accurately looking football stars, but at the core its brand of football is still overly simplified. Sure, it’s entertaining as, but ultimately it is not the real thing. I would very much appreciate it if you could wake me up in the year Electronic Arts truly rises up to the challenge instead of bringing forth another Alex Hunter episode. To be frank, though, by now I wonder if it is even aware let alone interested in solving this problem. FIFA 18 is not the video game manifestation of the beautiful game I would have liked it to be, but as general entertainment, it is still pretty good. It is the equivalent of watching a silly comedy: anyone can do it for hours and hours, and although they won’t come out better people for it they will not feel like they completely wasted their time. 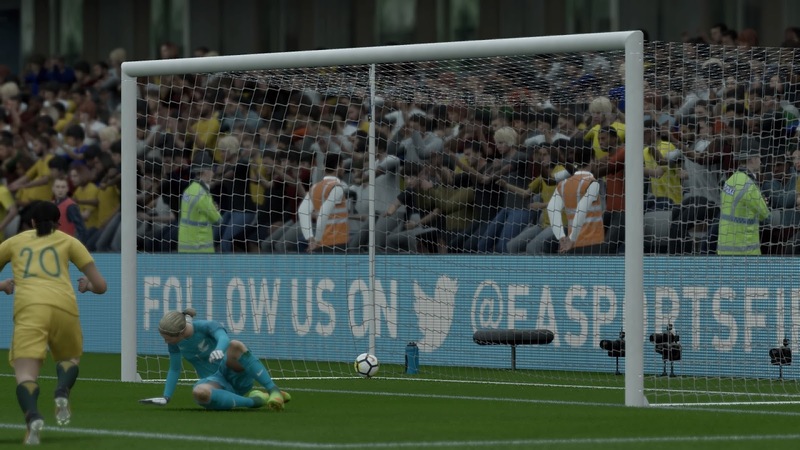 Yours truly likes FIFA 18’s tactical leanings in particular, but I don’t think real life football needs to worry about the virtual outdoing the real yet. At least not till FIFA’s 2018 World Cup edition.